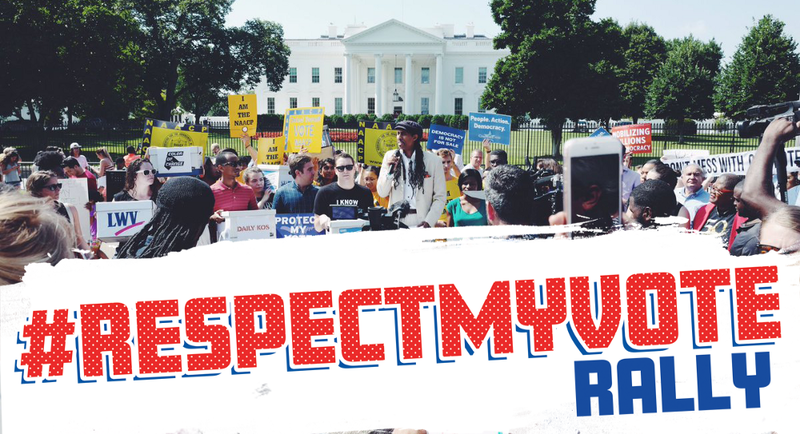 Hundreds of people gathered for our #RespectMyVote Rally in front of the White House the morning of July 19th to protest Trump’s “Presidential Advisory Commission on Election Integrity. The conversation also grew online, as #RespectMyVote rocketed to the #3 trending topic in America on Twitter, and stayed trending all day long. In addition, over a half million people signed petitions pushing back on Trump’s plan to suppress voters, and those petitions were at the rally in front of the White House for delivery. The commission, more appropriately known as Trump’s “Voter Suppression Commission”, is nothing more than a sham — as noted by the Washington Post — created in response to the blatant false claim of voter fraud in America. Ever since losing the popular vote by almost three million votes in the 2016 election versus Hilary Clinton, President Trump has been obsessed with proving that there was wide-spread voter fraud. Earlier this year he claimed, without one shred of evidence, that 3–5 million Americans voted illegally during the election. Now he is out to prove this false claim and is using the power of the Presidency (and your tax money) to set up a which-hunt team full of voter-suppressor all-stars. Each of member of the commission has a long track record of suppressing the vote and blatant attacks on the Voter Rights Act. Instead of focusing on solutions to ensure more people are able to vote, such as modernizing voter registration, this commission is going to embark on a which-hunt in order to prove a false claim and set up the justification for actions that will make it harder for Americans to vote. They have long decided that those who are the most vulnerable in our country — young people, seniors, people of color — need to have more between them and the ballot box. Voting is the fundamental right of our democracy. It is a cherished right that our soldiers die for. The United States should be a beacon for democracy throughout the world and lead by example. This new commission completely goes in the the opposite direction. However, we have seen all of this before. And just as Dr. King and so many others did throughout this country’s history, we are going to fight with everything we have to protect our voting rights. We will always be there to protect voting for all. We had a very special guest join us for the rally — No Malice, from the legendary hip-hop duo Clipse. No Malice also wrote an article about why he was there. Check out “No Malice Writes Letter ‘Why I’m Rallying at the White House’”. You can help push back and demand that voting is made easier. It’s our American right! Click here to say #RespectMyVote!